Behind this attractive cover is a cute ‘buddy’ story featuring a djinn, a sin-easter, a spell-caster, Death, and a few other paranormal figures. Seraphina is an immortal who is cursed with a hex. She currently lives with a good friend Finn, a Sin-Eater. Finn’s girlfriend is Khat. Seraphina meets Marceau who is an accomplished spell-unweaver – someone who is able to see a spell and trace it and unravel it, freeing the person who was hexed. But the spell around Seraphina is complicated and reacts in a very different way, which will stretch Marceau’s power. But Marceau has a benefactor who wants something else from group. While reading this I generally enjoyed myself and the characters involved. It read quite easily, and there was enough of a story to keep me interested. But there were moments throughout that kept this a bit pedestrian. Sometimes the characters expressed themselves in ways that made them childish (“Stop it, you two. You can bond in a minute, right now I am busy having a hissy fit.”) instead of dangerous supernaturals. As I say, I liked the characters themselves, but the relationship between them isn’t nearly as strong as author S.E. Summa wants us to believe. The romances don’t feel real, and the danger that we should sense periodically never seems like it is imminent (even when it is) or final. The danger seems like just another minor obstacle to the four being able to hang out together. And a minor, quibbling point. When I read “Lynette turned … and mouthed, ‘Danger. Stay here. '” I stopped, thought about it. Seriously…try mouthing those words. Do you think anyone would understand what you’re mouthing? I liked the book well enough that I would read a second volume, but not so much that I would recommend it enthusiastically. Looking for a good book? 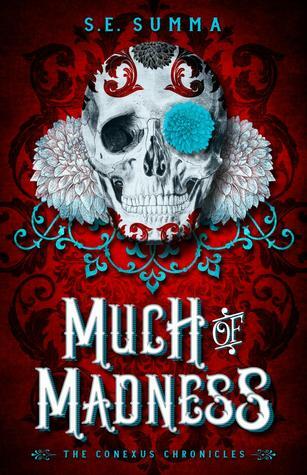 Much of Madness, by S.E. Summa is a light, friendly (perhaps ‘cozy’) paranormal story that is entertaining but lacks depth or bite.